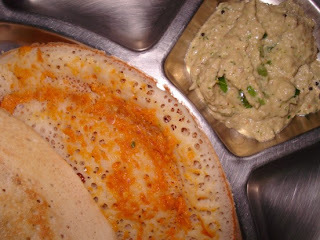 Cooking 4 all Seasons: Erra Karam Masala Dosa ~ Andhra Specials! 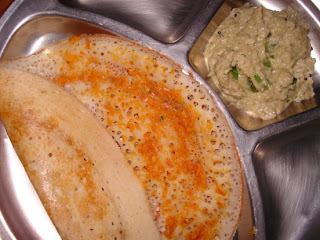 This is my 100th post and I am celebrating it by posting my hubby dear's favorite dosa types - Erra Karam Masala Dosa. Erra Karam as in Telugu means Red Chilli Masala, this I came to know is hubby favorite dish which he very passionately confessed during my Athamma's earlier visit. He said his mother used to make hot hot dosas and he won't even budge from the table and continue eating them. Never counts how many devoured. 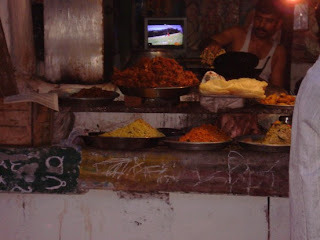 He says the hot spicy nature mixed with the hot from tawa makes this one super duper dish to eat. Well I had to believe him, so I asked Athamma for the recipe. She infact had two! No end to these people's fancy to Red chillis! In the early years of our marriage, I had tough time preparing anything and meeting dear hubby's nod. It used to be so funny, on one side of the table you would see one puffing and dabbing himself off because of the spiciness, on the other side another person, so cool as if there is nothing amiss in the dish. I was referring to my Dad who is normally seen wiping his face off frequently when he eats something specially prepare for the son-in law. The other side is my hubby dear, who has till date never confessed, to have eaten a spicy dish at our home! My brother wouldn't even bother to venture near the place if something like this is on the table. Amma, of course was only worried about pleasing the son-in-law, so prepares something else for Dad. This was a typical scenario for quite sometime. So it was so much pleasure when I discovered that I could please hubby dear with such a simple yet delicious combi of Red chillies or Erra Karam on Dosa. No cooking time as this is raw! Raw grind all the ingredients together. Take a ladleful of batter and spread out a thin dosa on a hot tawa. Sprinkle oil or ghee on the top. Turn it over. Once done, take a spoon of the spicy masala and spread over the dosa. The raw onions with red chilli and garlic crushed gives an excellent taste to the ghee roast Dosa. Chop Onions into fine pieces and mix with red chilli powder. Spread over the hot dosa before removing it from tawa. We serve these with Groundnut/Peanut Chutney, which is an all time Andhra favorite! 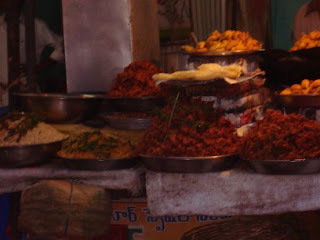 During our recent visit to Guntal, Andhra, I took this snap of the Street vendor selling Uggani. When I was writing that post, wanted badly to show that street snack which is common in that place, was able to get a picture this visit.